Also see the Florida Airlines timetable gallery. 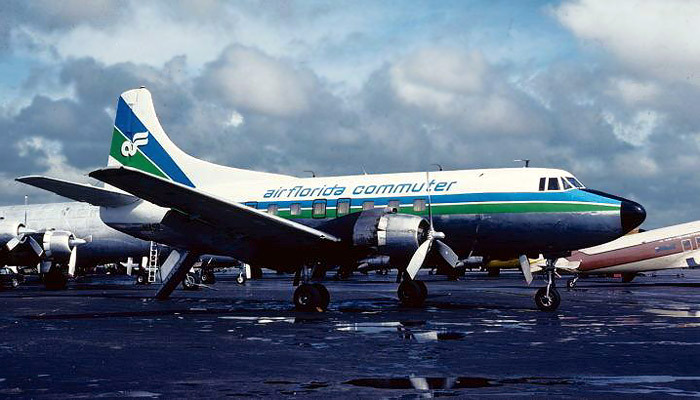 Florida Airlines was one of the largest commuter carriers in Florida during the 1970s and claimed to have the largest DC-3 fleet in the world in 1976. The airline purchased Air South and Shawnee Airlines in 1975 and operated both as subsidiaries. The airline went into decline following the passage of airline deregulation in 1978 as numerous major airlines began flying directly into Sarasota and Ft. Myers, making Florida Airlines connecting flights unnecessary. The carrier shut down on January 11, 1980 but was briefly resurrected later in the year, and conducted flights as an Air Florida Commuter carrier for a brief period in 1981. With debt mounting, Florida Airlines was reorganized as Southern International on August 8, 1981 only to fold yet again four months later. ​Below: Florida Air Lines timetable cover with route map from August 10, 1969. 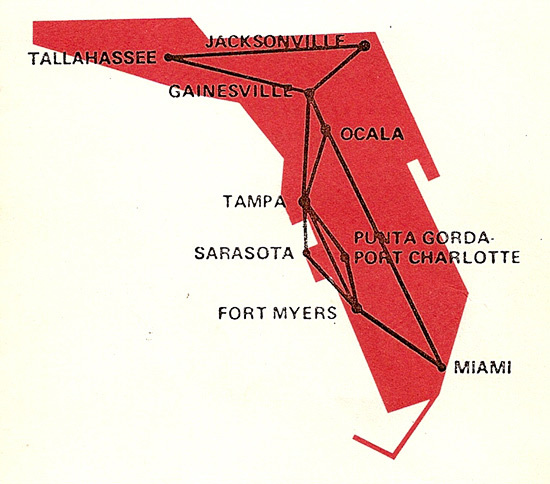 Florida Air Lines route map from September 1, 1974. Florida Air Lines DC-3 N341W (msn 13041) at the Sarasota, base in 1975. Beginning in 1976, Florida Air Lines advertised itself as "The Connection" and applied the titles on several aircraft. N79B (msn2247) formerly flew with Eastern Airlines. 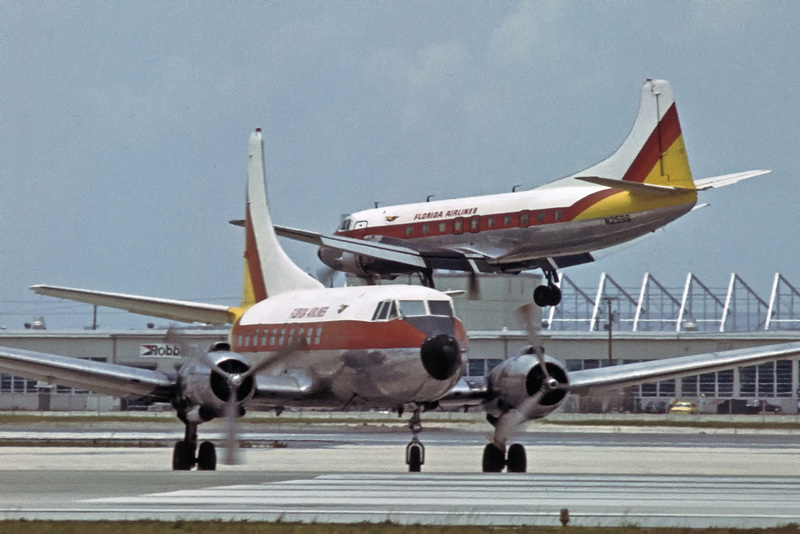 Florida Air Lines took over Air South in 1975 and replaced that airline's fleet with DC-3s. Planes were used interchangeably between the two route networks and dual titles were applied to several of them. When Shawnee Airlines shut down in 1977, three of their hot-pink-and-yellow Martin 404s went to Florida Air Lines. 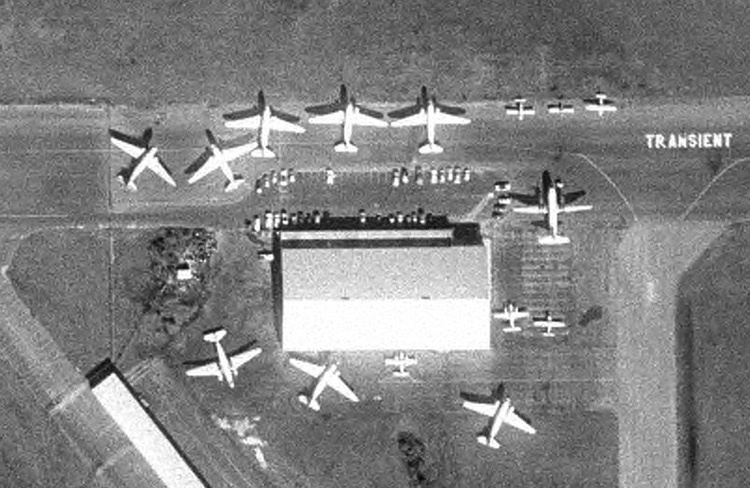 Eight DC-3s and a Martin 404 are among the many aircraft parked at the Florida Airlines maintenance base in Sarasota in this December 7, 1977 Department of Transportation aerial photo. 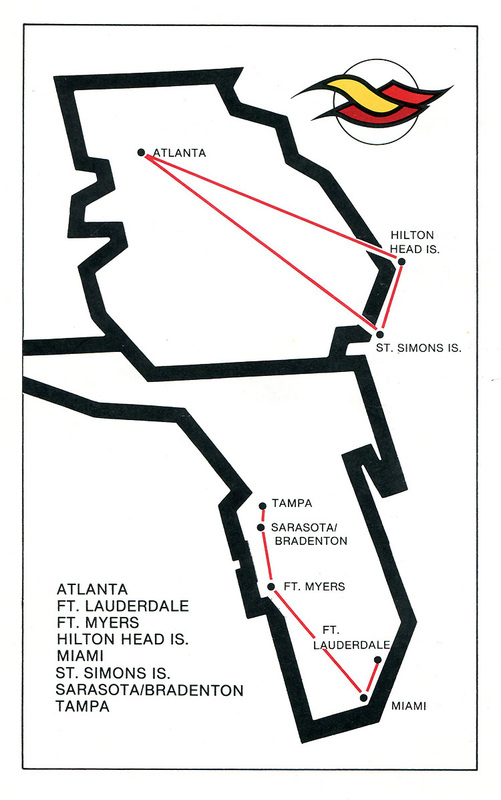 Florida Airlines / Air South route map effective December 15, 1978. The Martin 404s eventually replaced the DC-3 fleet. N144S, "Sanibel Island", is pictured at Atlanta in June 1979. 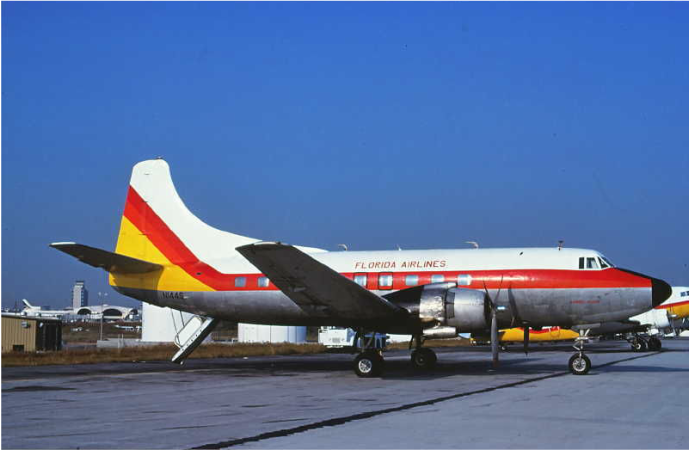 Florida Airlines shut down on January 11, 1980 and filed for bankruptcy protection on January 24 in federal district court in Tampa. Within months, the airline resumed limited service to Miami, Sarasota, Ft. Myers and St. Petersburg. The new owners made a failed attempt to merge with Marco Island Airways to form Air Omni. Although the merger never came to fruition, Air Omni titles were applied to several aircraft. This stunning photo comes to us from flickr photographer Malcolm Nason and was taken at Miami in 1981. N259S lands on the cross runway while N144S lines up for departure. A side note - Florida added logos to the fuselages after emerging from the 1980 bankruptcy. In Spring 1981, several Martin 404s were repainted in lime and blue and operated segments of the Air Florida Commuter network. On August 8, 1981 Florida Airlines reorganized as Southern International, which lasted only a matter of months before shutting down. For additional timetable images and information, visit the Florida Airlines page Timetable Images.